“I’m Howard Hughes” – Melvin and Howard (1980) | "This Film Should Be Played Loud"
Jonathan Demme’s criminally underrated Melvin and Howard opens with this great sequence in which down-on-his-luck Melvin Dummar (Paul Le Mat) picks up a grizzly old man (Jason Robards) he’s found lying on the side of the road in the middle of nowhere. 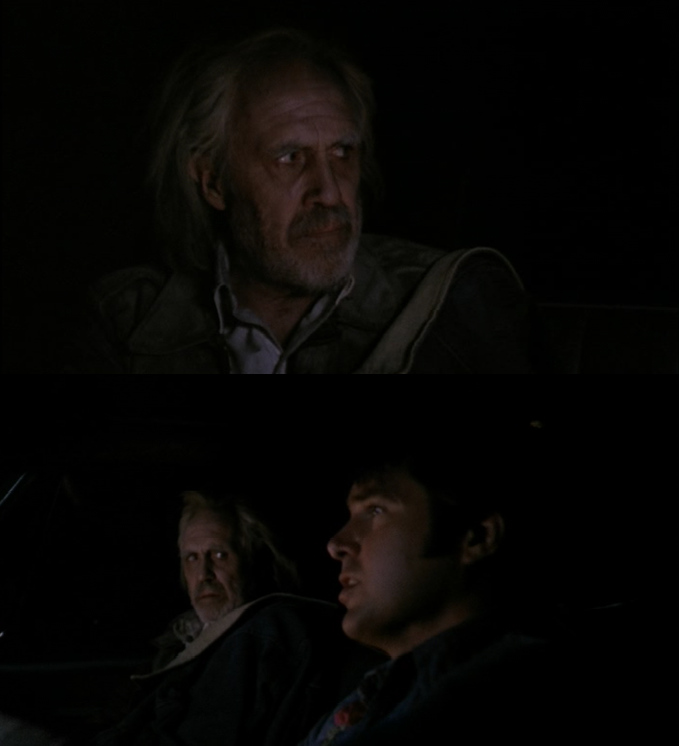 We then sit back and watch as the two characters get to know each other in Melvin’s pick up truck. Things get even more interesting as the old man claims to be legendary reclusive billionare, Howard Hughes. What’s so great about this scene is just how rare it is in movies these days. Demme slows everything down and gives us the time to get to know these two characters (who couldn’t be more different) through a very normal and very sweet conversation. Also, seeing Jason Robards sing “Bye Bye Blackbird” is both haunting and beautiful. The scene lasts a wonderful ten minutes but you’ll wish it was longer. This entry was posted in You've got a killer scene there, man! and tagged 1980, Jason Robards, Jonathan Demme, Melvin and Howard, Paul Le Mat. Bookmark the permalink. I have never seen the movie however I have met Mr Hughes and I am looking for a picture that I witnessed being taken of him in March of 1971 in, Las Vegas Nevada. The photograph has Howard Hughes with long hair standing with Levar B. Myler, (a senior Penthouse Aide),to his left and John H. Meier, (his business adviser who is better known for his involvement in Watergate), on his right. In a black Cadillac Limo parked at the curb was two more men. John M. Holmes Jr., (another Penthouse Aide), sitting in the front passenger seat and an unidentified driver. Of course it has been forty years since the photograph has been taken and I believe it will be found because of the circumstances that surrounded it.